In 2017, The University of Warwick launched a new translation prize (the Warwick Prize for Women in Translation) to honour the best published translated work by a female author. On the back of this success, in 2018-19, the School of Modern Languages and Cultures and the Department of English and Comparative Literary Studies at the University of Warwick will pilot a national translation prize for undergraduate students. This prize will be launched at the awards ceremony for the Warwick Prize for Women in Translation on November 13th 2018. The new competition aims to encourage students to engage with languages outside the classroom. We would like to show that translation is a fun and creative activity which can be productive at all linguistic levels and grow an interest in translation and intercultural exchange amongst undergraduate students. 2. A critical reflection in English (300 words) on your translation approach. To help you with your translations, the University of Warwick will run three translation workshops on (1) translation and song, (2) translation and theatre, and (3) translation and literature. Webcasts will be available after the workshops for students who are not based at Warwick – please keep checking this webpage for updates. The set texts will be released on Tuesday 7 May 2019 and entries can be submitted between 7 May 2019 and 28 June 2019 at 5pm. The deadline on 28 June 2019 at 5pm is final. 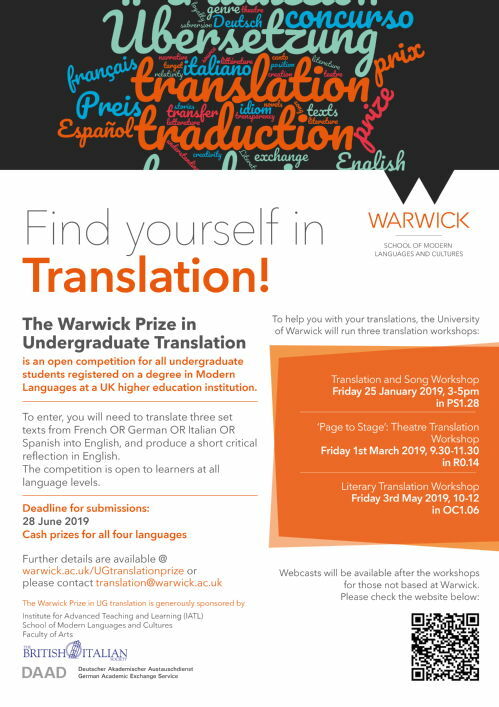 The Warwick Prize in Undergraduate Translation is generously sponsored by the Institute for Advanced Teaching and Learning, the School of Modern Languages and Cultures, the Faculty of Arts, the German Academic Exchange Service (DAAD), and the British Italian Society.